For Christmas we had our friend over last night and had a dinner and had the nativity and today we just did really simple and went to the beach, Carillo, with four people from our ward. It was overcast so it wasn't sunny but it was great! We were nervous for the kids about Christmas but when they woke up this morning they were all excited about their presents and it was great. It took a long time to open presents cause everyone had to take their turn. That was all I caught, hope I got it right! My audio went bad. I never went to Playa Carillo, but here's a link to where it's at and a photo from online. 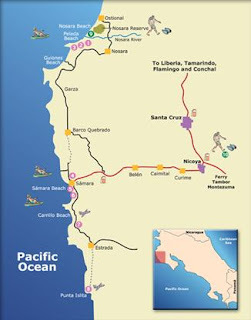 The RMs live about 5 kilometers southeast of Nicoya. See here. Try either one, cause they live together you know! So you'll usually be able to get through to who you want to chit-chat with. You'll have to buy some skype credits to call a cell phone from your computer, but it's pretty cheap - land lines are 2 cents a minute, my call to their mobile in CR was 9 cents a minute. So go and give them a call! They'll be so surprised and would love to hear from you!!!! Merry Christmas to all the family and friends of the RMs! My friends we are living with in Costa Rica pulled a parasite/worm out of there 2 years old rear end. As in a mosquito laid an egg or planted a maggot in his right bum cheek and started the worm began to 'feast' in it new warm environment. All kinds of fun happening down here. As some of you have seen from our blog we live out in a beautiful home in the jungle. The down side to that has been some of the insect issues. Right now is mosquito season and we happen to be the nearest easy blood for miles around. We wok...e up one morning to find at least 30 siquito bites on each of the kids. We tried various deet free bug sprays, a natural vanilla formula but without much success. We then tried a 5% deet formula but it was almost useless. After pulling the parasite worm out of one Jame's rear end we stopped fooling around. We bought a bug zapper, got mosiquito netting, plug in Raid repellent for each room, and purchased a can of Off Deep Woods Formula (25% Deet. After all we are in the deep woods). We had so many bugs inside at this point that we would get swarmed just turning on a light after dusk. So contrary to instructions we set up the bug zapper in the kitchen and a marvelous time cheering as each little blood sucker got zapped and burned. The netting was somewhat successful (if the kids don't roll out of it in there sleep) and with the Deep Woods Off they each have fewer than 5 or 6 new bug bites in the morning. After 3 days of leaving the zapper inside we killed most of them so the zapper is now outside. We can now use the lights at night without a problem. We are still examining the children each day for unnatural bumps in their skin that would indicate a maggot nest. The week before the dog had to go to the vet. He pulled 15 worms out of her. Can't let your pets sleep outside during 'siquito season. So my wife, all the kids, and the Royal family watched and lear...ned. When it came time to do it for one of the children it was my 8 year old daughter Mary who remember the step by step procedure or that the vet said to put Vaseline over the hole so the parasite can't breath. Amazing what children can recall. So our wives followed Mary's instructions and it worked! The RMs, as the Royals and Meyers have come to be know on my blog, have been a big time blessing in my life in so many ways. On Thursday they blessed us by taking me and the kids to the airport. Jacob and Dannan let the kids abuse them (see Wes in the above photo? He's got Jacob's legs) Rachael changed Lily's diaper, Melanie and Rachael helped me fill out 8 boarding pass papers with our Chile address and everyone's passport #s. My hands were totally shaking during that - I think I was now feeling the stress, but they pulled me through the toughest part of checking in luggage and walked us to security. We said goodbye and then as we were taking off our shoes and checking in then Ethan looked at me with an expression of panic on his face... he started to cry "MAX!!!!" He left his webkinz cocker spaniel stuffed dog, lovingly named Max, in the van. The RMs were still there making sure I got through security, I yell over "Ethan left a stuffed dog in your car!!!" and off they go running to our rescue again. I pace for a few minutes, not knowing how long it will take. Hmm, I'm thinking we can't wait... "Eth, I think they had to park far away! I don't think we can wait... Max will be safe with them, we'll have them send him in the mail, we gotta go!" I go to tell Melanie to just keep him and we'll get him later, but she says "They got it right here!" and here they are back lickity split and Max was returned. Ethan gave him a big hug. A small miracle for Ethan, I look at him amazed and said "You said a prayer, didn't you!!" We smile, finish going through security, and are on our way to Chile. Hasta Luego Costa Rica! Vamos a Chile! It will be a grand adventure. Miss you already Rachael and Jacob! Take Care, keep in touch, and we will see you again! Praying for Miracles, and it works! I think I'll let Rachael and Melanie post the details about this little story. If they are too slow and you're dying to know the story, feel free to send them threatening emails. We are so thankful for answered prayers!! On Tuesday on our way back from Samara, the RMs and I decided we should get together again this week and have a girls night out for the Moms. We thought it would be best to do it in Villareal at our place. And, if they are gonna drive all the way out here anyway, anyway, that we might as well all just go to a beach too? So it was arranged. Playa Flamingo, and let's get all our American friends - the Martinsens and the Heathman's to come too. So it was. We got there around 1 and stayed until sunset (5:30). With our big group it looked/sounded like Raging Waters - water splashing, kids squeeling. It was great. Couldn't have asked for a better beach day than Friday - it was a BEAUTIFUL DAY!!!! It was sunny! There were hardly any clouds in the sky. Melanie and Dannan and kids had so much fun - they were out in the water most all the time so these are about as good of pictures as I got of them. It was fun to watch their family all play together - Tuna stayed with the Nursery group on the sand... The Santa Cruz Branch President, Pres Lopez, played there with the babies digging and patting sand. He was so cute with them! Making sure they get sand everywhere they can!! The kids worked the last hour or so on some sand forts for a mudball fight. Here's Michael's fort. Abi found a hermit crab - she's so proud of herself! The boys love getting down coconuts and cutting them open. It's cute. And all the rest of the kids love to stand around and watch the process. Michael - working up a sweat - can you see it dripping down his face?